Cycling culture continues to make inroads, both globally and in our little corner of the Midwest. Massive bicycling infrastructure plans have been implemented in cities such as London and Paris. And even the City of Chicago is trying to do its part if too slowly and ineffectually, to make much difference in the near term to your average Logan Square bike commuter trying to avoid death by collision on a daily basis. While we have a ways to go in making the streets of Logan and other Chicago neighborhoods truly safe and accessible to cyclists, it’s worth noting that Logan has been a crucible of cycling culture for more than a century and is generally friendly to bikers. Our surfeit of Divvy stations and large population of habitual cyclists are predated by the arrival of one Ignaz Schwinn. The last name, at least, should be familiar to cycling aficionados. The Schwinn Bicycle Company was once one of the leading manufacturers of bicycles in the United States—having cornered a quarter of the market by the 50s—and vintage Schwinn bicycles are still highly regarded. 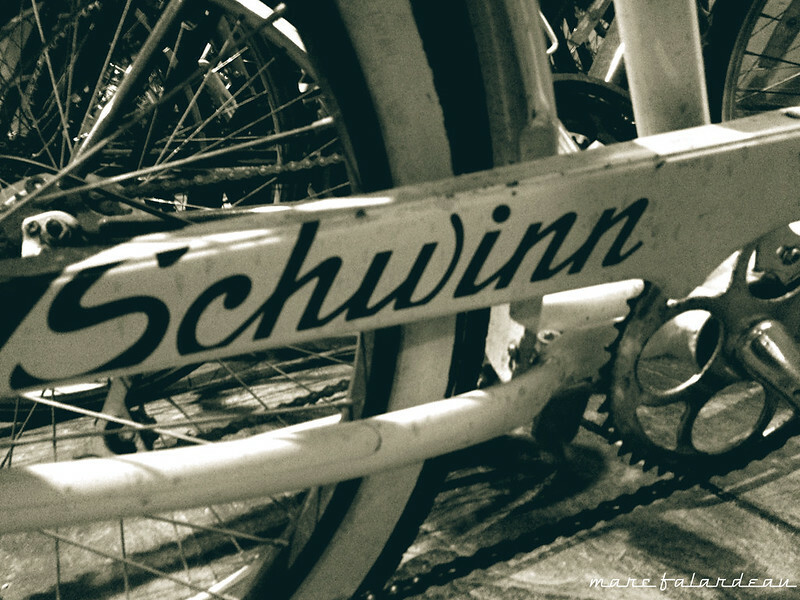 The German-born Schwinn (1860-1948) was an early investor in the cycling boom that began in the mid-19th century. Though cycling was in its early years mostly an upper-class leisure activity, by the 1860s, it had democratized somewhat as manufacturing processes became more efficient and costs dropped. Schwinn helped to introduce the British-invented ‘safety’ bike, which soon replaced the ponderous high wheelers of the day, to the Heinrich Kleyer factory in Germany. In 1891, Schwinn immigrated to the U.S. and settled in Chicago. Here, he worked for several bicycle manufacturers before partnering with meatpacking magnate Adolf Arnold in 1894 to found Arnold, Schwinn & Company. Arnold was also a banker and president of the Haymarket Produce Bank. In light of the booming business for bicycles, this was a sound investment on his part. Arnold, Schwinn & Company was officially incorporated on Oct. 22, 1895, 123 years ago this month. At the turn of the century, some 300 companies were producing bicycles in the U.S. About 30 of them were based in Chicago, which was producing approximately 50 percent of the countries two-wheelers by 1900. Lake Street and Wabash Avenues were hubs of this developing industry. Initially headquartered at Lake and Peoria streets in the Fulton Market District, in 1901, Schwinn moved his enterprise to Hermosa, at 1856 N. Kostner, after having purchased the failing March-Davis Bicycle Company. Six years later, Schwinn moved his wife and two sons into a newly constructed mansion at Sacramento and Palmer, with a view of Palmer Square Park, which honors John McAuley Palmer, the 15th governor of Illinois. The Cribs-worthy abode featured a garage with a turntable that allowed him to reposition his car so that he did not have to back it onto the street. According to Chicago History Museum curator Peter Alter, building housing for your employees was not totally unusual at the time. “Pullman on the South Side would be the shining example of a company building housing for its workers. Of course, the way that Pullman controlled the Pullman town was much different than [just] building an apartment building for your workers,” Alter explains, referring to what is now the Pullman Historic District on the Far South Side. Pullman was the first town planned just for the workers of one employer, George Pullman, who invented the Pullman sleeping car. Indeed, in the Gilded Age, our neighborhood was populated largely by European immigrants from Germany and Scandinavia. The area now known as Logan Square was annexed by Chicago in 1889. In the preceding decades, architects including Daniel Burnham and Frederick Law Olmsted had begun work on the design of Chicago’s Emerald Necklace, the 28 miles of boulevards encircling the city. In 1871, William Le Baron Jenney, designer of the first skyscraper, had begun laying out the boulevard system now comprising Logan, Humboldt, and Garfield parks. Among his contributions was Palmer Square Park; many of his designs were later refined by famed landscape architect Jens Jensen. Though mansions sprung up along this Parisian-inspired system, wealthy and working class rubbed shoulders more than they might have in other neighborhoods. Arnold, Schwinn & Company was officially incorporated on Oct. 22, 1895— 123 years ago this month. The wealthy of the area were largely northern and western European immigrants and their first-generation children, whereas areas like the Gold Coast were populated by people several generations removed from their immigrant roots. The shared heritage of Gilded Age Loganites may have made them more comfortable living alongside less-prosperous neighbors from the same areas of Europe. Schwinn’s working class employees, while luckier than some, did not necessarily have an easy life. While the working class was still struggling with a wide variety of issues, there were encouraging signs of progress during this period. The rise of cycling culture was one of them. With the increasing accessibility of bikes to lower-income workers, a new leisure activity emerged, one that could be pursued by upper and lower classes alike. While purchasing a bicycle was still something of an indulgence for some, many saved up and made the leap to life on two wheels. The cyclists speeding around the city became known as “scorchers,” a jeering term referencing their disregard for pedestrians—one that seems equally applicable today. “There was a confluence of different things,” Alter notes in accounting for the phenomenon. 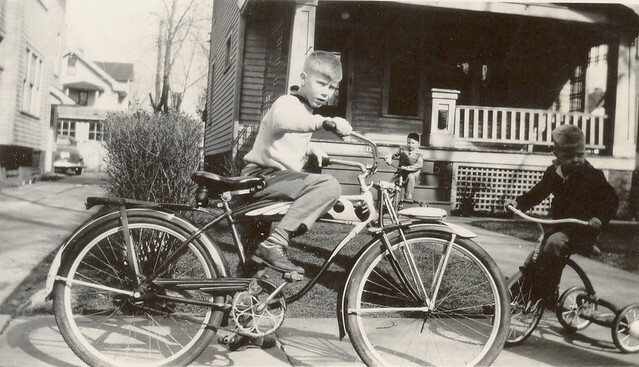 A boy on his Schwinn bicycle, c. 1964. Logan’s own boulevards were often the scene of bicycling events. An 1896 article in the Chicago Tribune remarked upon the colorful parade of cyclists who held their annual rally in Palmer Square Park. Alter relatesf the story of Elmer Whiting, a Garfield Park street car conductor, who in 1894 purchased a bicycle for his wife and soon thereafter, one for himself. His family would tour the city on their two-wheelers, taking in sights ranging from the splendor of the lakefront to the grim but astonishing agro-industrial complexes of Back of the Yards. Ignaz and Frank W. Schwinn, c. 1917-18. Schwinn continued to capitalize on the growing interest in cycling. In 1908, he bought out Arnold, who had lost interest in the venture. As early as 1896, the Haymarket Produce Bank is noted as having been in “shaky” condition, so that may have influenced his decision. A dip in demand may have also played a part. Schwinn’s company was among the few that survived that downturn. That year, a new factory was erected at 1718 North Kildare, also in Hermosa. (North-Grand High School now sits on the site.) The company began selling its cycles through the Chicago-based Sears, Roebuck, and Co., further expanding its market reach. Between 1911 and 1914, Schwinn branched into motorcycle manufacture as well, marketing his motorbikes as Excelsior-Hendersons, after the companies that he purchased. When the U.S. entered World War I in 1917, Schwinn turned his attentions to making bicycles for the military at the plant on Kildare, an endeavour that continued for nearly two years, until the end of the war. At around this time, Schwinn’s son Frank began taking over many of the management duties, though the aging Ignaz remained on the board and was still a key player in the company’s decision-making. The company divested itself of its motorcycle holdings in 1931, on the heels of the 1929 stock market crash, and again devoted itself exclusively to the manufacture of bicycles. During the first three decades of the century, despite wildly fluctuating markets and international instability both economically and politically, Schwinn maintained a hold on the industry, manufacturing 45,000 of the roughly 330,000 bicycles manufactured in the U.S. each year. 1944 advertisement for Schwinn bicycles. Through shrewd business management and unwavering attention to quality and detail, the company even survived the Great Depression, notably introducing the balloon tire in 1933, a feature that soon became standard. The 30s were characterized by the rollout of sleek, lighter models whose design mimicked that of motorcycles. That period saw major societal changes worldwide and Logan Square was no exception. “By the time the stock market crashes and the Depression hits in the 30s, a lot of properties are subdivided or become vacant,“ Alter says of the changing demographics of the neighborhood, which included an influx of Jewish immigrants. The Schwinns rode out these changes with equanimity. In 1940, the company introduced the front brake, a notable safety improvement. It again turned its attention to the war effort with the entry of the U.S. into World War II, a period during which, like many industries, it hired more female workers due to the number of young men who were shipped overseas. At that point, some 1,000 Chicago youths and men had been employed by Schwinn. Ignaz Schwinn died in 1948; in an ironic twist, he is buried at Rosehill Cemetery, which prohibits bicycling. His partner, Arnold, who died in 1912, is buried at Graceland, which opened its grounds to cycling in 2017. By 1955, the Schwinn family had vacated Logan Square, donating its mansion to St. Sylvester Church, which demolished the building. An auditorium, called Schwinn Hall, stands in its place. 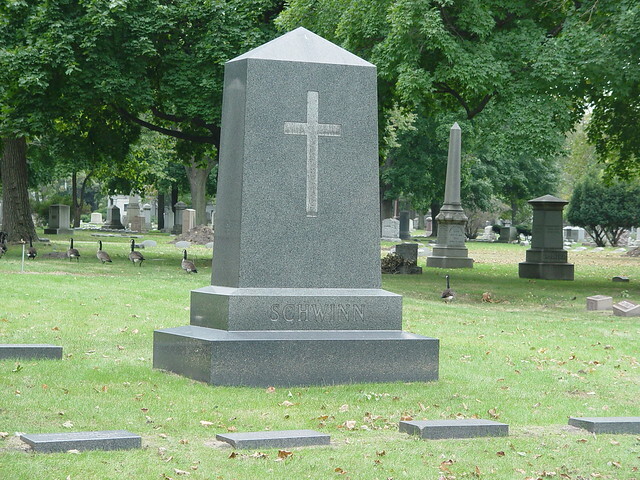 Grave of Ignaz Schwinn, Rosehill Cemetery. The company nonetheless maintained its presence in Hermosa. Though mismanagement by Schwinn descendants led to a 1980 strike in which 1,400 workers walked out, the first in the company’s history, the company persisted, using computerized design methods and acquiring interests in exercise machine manufacture. In 1982, the company moved its operations to Greenville, Mississippi. A decade later, it declared bankruptcy, and in 1993 began selling off assets. In 2001, the brand was purchased by Pacific Cycle, now owned by a Canadian firm. The bikes are now manufactured in Asia and Eastern Europe and are sold at big box retailers like Wal-Mart. The story of Schwinn and his residence in Logan Square serves as a parable for the historical factors that shape the area we now inhabit. “You have all of these forces coming together to change Logan Square from the neighborhood Schwinn moved into in the 1890s to when his descendant moves out in the 1950s,” Alter says. One hopes that Schwinn might be pleased to see the increasing installation of bike lanes and amused by the “scorchers” tooling around his old stomping grounds today. Schwinn Bicycle Company catalogue, 1977. Photo Courtesy of the Chicago History Museum’s historic image collection, available at images.chicagohistory.org. Unnecessary ad hominem remarks aside, you seem to misinterpret the points I’ve raised. They aren’t really a defense nor should they be taken as insulting; they’re an attempt to give you some context and perspective, which are sorely lacking in your critique (which, I might add, is not particularly constructive). There’s no defense needed, really. The subject of the article is pretty self-explanatory. The later period in history that you seem to feel that I should have concentrated on constitutes about four sentences in a 2,000+ word piece. And that was intentional. The later history is meant as a bookend to the period covered in this piece; the same is true of the contemporary references in the introduction. The error you make is in imputing some sort of intentional omission when it’s simply a function of the time period I’m focusing on. Your remarks aptly illustrate the reasons that criticism of grievance studies is intensifying. You take a perfectly legitimate and important area of study—the history of the Latino presence in Logan and current gentrification—and map it onto a subject to which it is only tangentially relevant, if at all. If I’d been writing about cycling in Logan in the mid 20th century, you’d absolutely have a point. But I wasn’t. And you don’t. No, but I did hear the “clunks” as your empty arguments hit the ground one by one. I didn’t ask you to write about “gentrification” or “Latino history” or a whole “history of Logan Square” or any of the other absurd tangents you add on to make your ‘straw man’ argument. You have that exactly backwards from what I wrote. In fact, after this I would hope you do not try to write on those subjects. And, once again, your article is not “historically delimited” to the first half of the twentieth century, as you report on changes at Schwinn into the sixties, seventies, eighties and nineties, and gentrifying businesses today. You just stop reporting on “biking culture” when the people become majority Latino. My point stands. Rather than simply recognize that newer, upscale gentrifying businesses and white newcomers are your entire social vista, and that you have little or zero contact with Latinos who make up half the community, it is painfully lame to hear that “no such lead was in evidence” or it “just didn’t come up.” Translation: ‘I live in a white bubble and I accidentally illustrated that very clearly.’ If you seriously would have had to “troll the streets randomly” to learn about the connections between older Boricuas and Schwinn bikes, you are only emphasizing this point. Even so, “Schwinn Cruisers Chicago” is a freaking Facebook page, not a dusty scroll at the Chicago History Museum. Illustrating your own ignorance while defending it is cringeworthy. Like most people being defensive you respond with a lot of distraction and denial and personal insults, but my initial points stand, as you either did not hear them, or realize you have no evidence against them. And, yes, I do know more about research than you ever will, but no, I did not expect you to perform a randomized, race, gender, age and geography-stratified sample of life-course ethnographic interviews like I did. But I did not need to do any of that to know you ignored the biggest and most obvious legacy of Schwinn bicycles in the neighborhood. And, yes, that contributes to the racist discourse that is part of gentrification. I will not continue to write back to share more, as I get paid to educate people who actually want to learn what they do not know, and when given constructive criticism, they respond with more maturity and professionalism than you have shown here. I appreciate you writing back. I don’t agree with your claims. If Logan Square being a “crucible of bicycling culture for more than a century” is how you introduce the piece, then, yes, the bicyclists of the past 50 years are relevant to that. The very title of the piece begins with “Radler,” which is you literally referencing a recently opened eatery with a supermajority white clientele with a distant connection to Schwinn, so you are obviously connecting Schwinn history to the present. Just not the Latino present. Rather, the consumption landscape of recent gentrification. You discuss biking culture in Chicago just up until the fifties—right before the neighborhood becomes majority Latino—but continue to report on the Schwinn company into the seventies, eighties, nineties, and 2000s. So biking culture is interesting to you, until the neighborhood is Latino (when, I would argue, it actually becomes *more* interesting), where you arbitrarily choose to stop talking about local residents, but continue to report on Schwinn. It is your decision, and your lack of information, that makes you stop there, not some godlike editor telling you, ‘Stop at the fifties.’ You conclude by referencing present day bike lines, the ““scorchers” tooling around his old stomping grounds today,” as well as Divvy bikes earlier, and Adam Bach, with a link to his site about his bar that lauds its German heritage. So your lack of contact with half the neighborhood, and the greatest bunch of Schwinn aficionados biking around it today, including somebody who put up a “Schwinn bike for sale” sign at Division and Mozart—I am not kidding you—literally last weekend, is the only basis I can see for you deciding to stop your history halfway. This is what the Old Wicker Park Greening Committee did to erase the black and Latino history of West Town. It is what the Continental does by hanging photos of old Polish patrons but not photos of the black and Latino patrons of the past 50 years, and what Weegee’s does by celebrating a Jewish photographer from New York while wiping the past 3 generations of Latino patrons from the decor. It is what Logan Square Preservation does by celebrating the early (European) immigrant history of Logan Square but not the current (Latino) immigrant history. It is a systematic erasure, and that is racist discourse, not just things said by the Klan. It is a product of you living in a parallel, and majority white, Logan Square to the one I grew up in and have lived in for 40 years. I can’t make you care about the other one, but if you are a writer trying to tell a story, and missed half of it, you should care at least about that. Do you hear that faint clunking sound? It’s my eyes rolling into the back of my skull. Humans are pattern-seeking creatures and one of the unfortunate side-effects of that is that they often discern patterns that aren’t actually there. You appear to have fallen into that trap in your frankly unreasonable assessment of this piece. Gentrification and the Latino history of the neighborhood are extremely important subjects and I would encourage you to check out this publication’s coverage of those issues, which has been ramping up due to recently increased staffing. Both are at the forefront of my mind and the minds of of my colleagues. They simply aren’t subjects that this one article delves into. We are a volunteer-only publication and as such have limited time and resources to devote to a very broad range of topics. Should you care to contribute some of your clearly extensive knowledge, please contact our editors through our webform. I’m sure they’d be happy to consider your ideas. As I explained previously, this article is historically delimited. That is: its focus is on Schwinn and his direct connection to the neighborhood, which occurs during a discrete period in time. It isn’t intended to be a full history of Logan Square. Also omitted from the article are: the life and times of specific Schwinn employees; a full history of the Jewish immigrants who comprised a significant portion of Logan Square residents at one point; the deficient bike lanes in the neighborhood; the number of automobile/bike crashes occurring annually; the history of Divvy; an in-depth description of contemporary cycling culture. They’re simply beyond the remit of the piece. Would any reasonable person infer that the omission of these subjects implies a lack of interest in them or an intentional erasure of them from the historical record? I think not. No single article can sufficiently describe these complexities. No reasonable journalist would try. You appear to thoroughly misunderstand how researchers and journalists operate, which is surprising given the fact that you possess an advanced degree and presumably have conducted a fair amount of research yourself. Given the dearth of written records of the Latino connection to Schwinn, how might a journalist be expected to have discovered them? As I’m sure you’re aware, journalists and researchers don’t just troll the streets randomly asking for information, as you appear to suggest that they should. They investigate leads. No such lead was in evidence during my research. As I said previously, the Latino connection to Schwinn is quite interesting and worthy of coverage. It just didn’t come up. I also didn’t interview the bike shop owners in the neighborhood or any bike owners. Doing so was outside of the scope of what the piece was intended to convey. It’s unfortunate that you’ve chosen to superimpose an irrelevant narrative on a piece that was simply intended to edify Logan residents about one, quite narrow, subject within an obvious temporal context. Doing so does a major disservice to the very serious and valid issues that you use to bolster your rather tenuously predicated argument. Beyond the above explanation, I really can’t indulge your concerns any further. I’ll simply reiterate my invitation to contribute suggestions or writing about the neighborhood through our webform. I worked on the packing line at the Schwinn plant in Chicago in the mid 70s.. I can’t speak to what the author refers to as Schwinn’s mismanagement in the 80s. But I can testify that the work during my time was tough and like many factories that relied on workers tethered to a moving assembly line, production quotas trumped any humane consideration for those who did the work. The article mentions Schwinn’s move to Mississippi but fails to place it in the context of the broader deindustrialization of Chicago and its impact on neighborhoods, including Logan Square, where I have lived since 1975. In addition to Schwinn, gone are places like Rock-Ola, Stewart Warner, Ludwig and Florsheim, all who employed a multi=racial work force from Logan Square and nearby communities. While the work was hard, those jobs allowed Chicago’s working class to provide for their families. The loss of that industrial base has had serious and negative consequences. What a great article and so well written! Very informative. Thank you! I like this. I dig reading about Logan Square history. I grew up in the neighborhood and still live nearby. But I find sad about this reporting is that it seems to find no need for recognition — or simply have no knowledge — of the longstanding connection of Schwinn bicycles and bicycling to the Latino community of Logan Square and the Near Northwest Side. As such it is in line with most of the cultural commentary that connects European immigrant history to gentrifying neighborhoods while wiping off the map any story of the migrants who were here for the last 3 generations. Ever heard of the Chicago Cruisers? Ever go by Mozart and Division on a Sunday afternoon to see the beautiful restored Schwinns lined up in the park? Anybody aware that Latinos in this neighborhood have for decades been scouring thrift stores for classic Schwinn bikes, repairing them, repolishing them, remaking them, tricking them out and riding them in the Puerto Rican Parade? 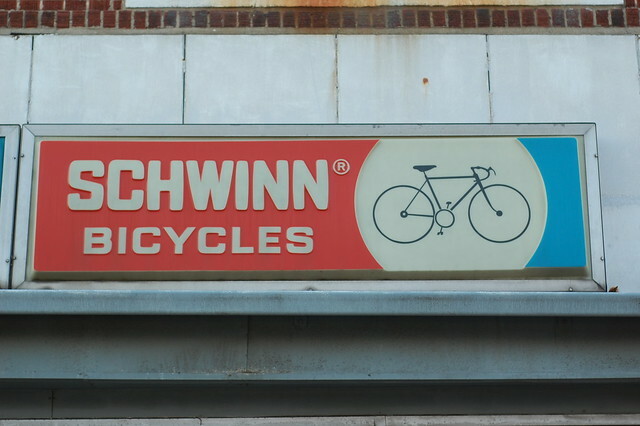 I have heard 60 year old men standing on Humboldt Boulevard tell me about the legacy of the Schwinn company and its connections to the neighborhood. Some of them may have worked there, and still live in the apartments mentioned, and have been Schwinn collectors for generations. You would think that would be relevant. You would think that would be, maybe, even BIGGER a connection than a single great-grandparent, unless the point is to connect European history to gentrifying businesses and call it a day. Its too bad, and not just because of contributing to a racist discourse. But also because some of the local knowledge of bicycling was never found or reported here. Mr. Mumm…Might you have any resources that you could link to regarding the Latino connection to Schwinn here in the comments? I researched the history of the company and its connection to Logan quite extensively and simply didn’t come across anything that discussed what you mention, which I agree would have been interesting and illuminating. I just did a quick search on the subject and not much was coming up. One Trib article on the Chicago Cruisers from 2011, which I hadn’t seen before, but that’s about it. I’m sure readers would be interested if you had some more in-depth sources to link to. I’ll also point out that: 1.) the history discussed in the article mostly ends prior to the shift toward a predominantly Latin population in Logan and Humboldt. The Latin influx began in the 1960s and 1970s. Schwinn was out of Hermosa by 1982; 2.) it’s a real reach to say that structuring it thusly is contributing to “racist discourse.” The article is simply not about the later periods of development in Logan, which I agree are interesting and worthy of coverage. But it’s one article. It’s not meant to be a comprehensive history of the neighborhood. Certainly, the end of Schwinn’s time in the neighborhood is worth mentioning, but as the title states, the bulk of the article is really about Schwinn himself and the rise of cycling culture in the 19th and early 20th centuries, not its later permutations.